All our products are Custom Made! 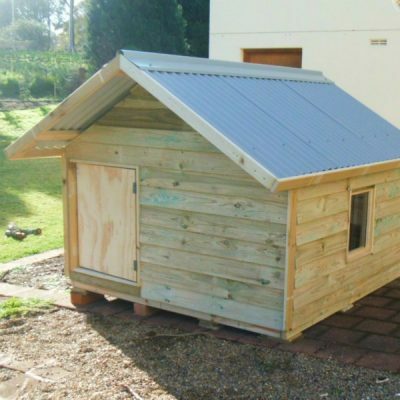 Wills Kennels, Chicken Coupes and Pet Enclosure, can be customised with any of the following accessories to suit your budget, whilst creating that perfect Kennels, Chicken Coupes and Pet Enclosure you and your pets have always wanted. Below are the quality products used in our product range, each one researched and chosen to specifically survive the most demanding of users, pets and children as well as the harsh Australian climate. 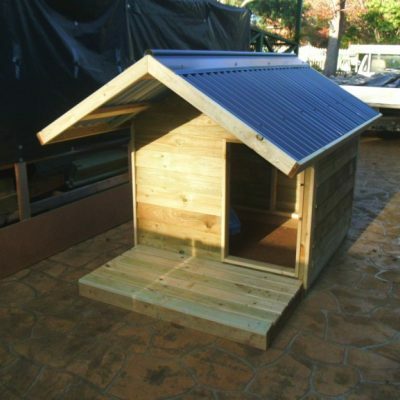 All dog kennel roofs are made with Colorbond® which unlike plastic cubby roofs or imitation roof tiles wont deteriorate, and are completely waterproof with a 40cm overhang, and rust resistant even during the worst of storms. In fact, Wills Cubbies will gaurantee that the kennel is 100% waterproof! There is also sufficient ventilation under the roofline to allow for airflow, making your dog’s house a lot cooler in summer than you’d think! Most importantly all colourbond roof edges are protected with a neat timber trim finish, while at the same time adding to the kennel’s charm. 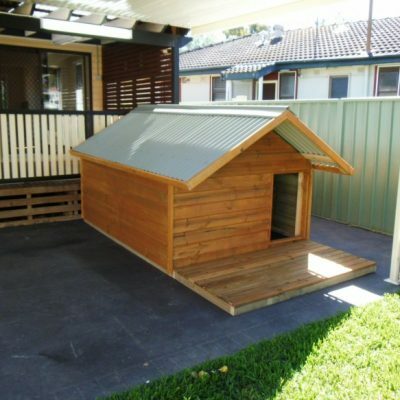 Kennels include a skillion (sloped) roof, which can be upgraded to a gable roof for $50 extra. The new and safe type of treated timber, ACQ is non-imported, arsenic free, naturally treated so it is pet and environmentally friendly and gauranteed to last for over 40 years even when not painted or stained! When customizing your kennel, Wills Cubbies and Cabins will guide you as to where it is best to position the door opening depending on how you are positioning your kennel in your backyard. All ground level kennels include a weatherproof solid treated pine floor frame with a moisture barrier so there is no need to worry about stability or a slab. On top of all this, is the yellow-tongue flooring which is both water resistant and solid. Structural Formply Flooring as used in concreting can be added for an extra price, to make your dog’s kennel even more durable and long-lasting than the standard yellow tongue flooring. Dog kennel trimming, corner stops & door frames come in ACQ treated pine with safety in mind, and can be painted white, pink or stained for $80 to give your best friend’s house a finished look without the need for an entire paint job and without you having to do anything! Staining the cladding with 2 x coats of a high quality, non toxic water-based stain will preserve the life and the look of the wood, as generally any type of timber (treated OR hardwood) will go grey within two years. With the use of Resene’s Woodsman Decking stain your kennel will look like new for many years. All paints and stains used have little or zero VOC levels (Volatile Organic Compounds) which means your pets have no harmful fumes to breath in.